Single phase power is typically reserved for lower power requirements, however in some cases powering a small motor with single phase input power is practical. Single phase motor starters are not commonly available since this is a rare case, and with a little bit of know-how, a 3-phase motor starter can easily be wired for single phase power. This is how Springer Controls does it in our UL508A certified panel shop. Previously, we discussed what a magnetic motor starter is (a contactor and an overload relay). The overload relay is designed so the current to the motor is shared between phases, so if you only wire up one phase, then all the motor current goes through one of the contacts on the overload, and you can actually create an overload condition. To prevent this, it is important to wire the starter so the current is balanced between the contacts on the overload relay. Here again is our picture of the 3-pole motor starter. 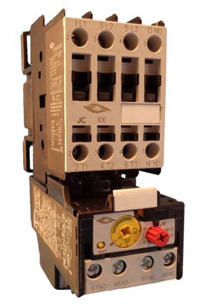 The contactor is on top and the overload relay is attached directly to it on bottom. You see 4 terminals because there are 3 poles and an auxiliary contact. As an example, the auxiliary contact can be used for something like turning on a pilot light on the control panel, to indicate the motor is operating. We start by bringing in the 2 power leads to L1 and L2 on the contactor. Then we add a jumper wire from L3 on the contactor to T2 on the overload relay. Please note, as this jumper wire will be carrying line power to the motor it is important the wire gage is selected based on the current load going through the contactor. This directs the current through from L2 and directs it through the 3rd phase on the contactor and overload (L3 & T3). Then you connect the 2 motor leads to T1 and T3. Using this method, the current is balanced between the 3 poles on the overload. 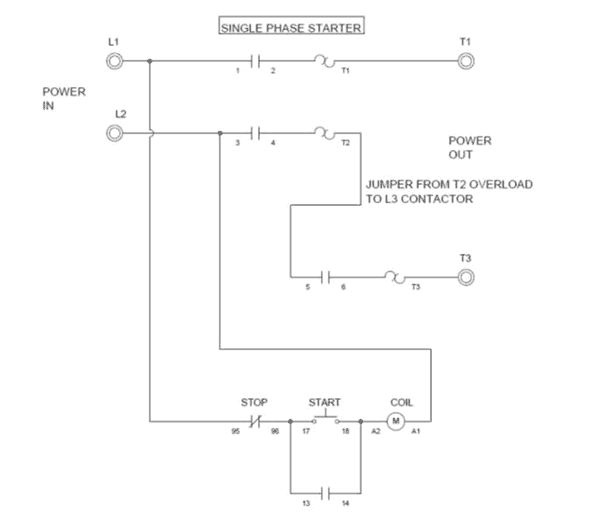 The below wiring diagram shows how we would assemble a complete motor starter, with a start/stop button for a single-phase motor, utilizing a 3-pole contactor. We hope this helps further your understanding of motor controls. As always, feel free to contact us with any questions. These notes and diagrams are intended to help understand motor control. We always recommend using a licensed electrician to ensure safety, and adherence to local codes and directives.